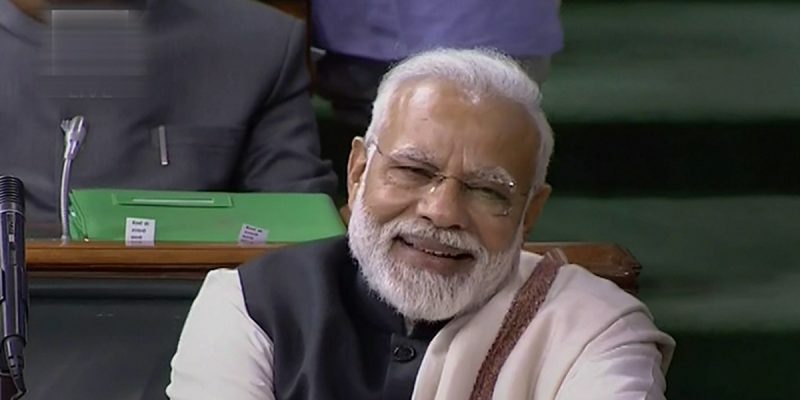 After Rahul Gandhi called Narendra Modi a 'coward' who took instructions from the Sangh, Narendra Modi launched a no holds barred attack on the Congress and the opposition in parliament. New Delhi: A verbal duel between Prime Minister Narendra Modi and Congress president Rahul Gandhi took an aggressive turn on February 7. Hours after Gandhi called Narendra Modi a darpok (coward), Narendra Modi retorted and said that it was the grand old party’s arrogance that had reduced it from “400 to 40” seats in the Lok Sabha. The exchanges also delineated the broad contours of the themes and issues that will figure prominently as the two leaders hit the road to campaign for the upcoming general elections. Earlier in the day, addressing a party meeting in New Delhi, Gandhi dared Modi for a ten-minute face-to-face debate on the Rafale deal and national security. He said he was sure the prime minister would run away. “I want to say he is a darpok (coward) person. I have recognised him. He gets scared when he faces someone who says ‘I will not back off’; he backs off,” the Congress president said. He had earlier coined the slogan, “Chowkidaar chor hai” (the watchman is a thief), in an apparent reference to Modi’s alleged cronyism in the Rafale deal. Taking his attack further, Gandhi alleged that Modi was following the diktat of the Rashtriya Swayamsevak Sangh, which he said wants to capture all public institutions in India. He said that the newly-elected governments in Rajasthan, Madhya Pradesh and Chhattisgarh will uproot the RSS’ loyalists from the system. He also mocked Hindutva icon V.D. Savarkar – a particular favourite of Modi – and accused him of once taking instructions from the British. He told the audience that the Congress party would protect all Indians, irrespective of religion, caste, and language. Later in the evening, Modi got an opportunity to speak in the lower house. He was replying to the debate on the motion of thanks after the president’s address. While he recounted his government’s achievements and attempted to take a shot at the opposition – which has been questioning his claims on development – the prime minister used the platform to make a political speech. He attacked the Congress for being arrogant and said that he hopes that the party moves yet another “no-confidence motion in 2023” – an indirect dig at the opposition, which is hoping to defeat the National Democratic Alliance in the upcoming parliamentary polls. Asserting that his government is for the poor, he dismissed the ill-effects of demonetisation. “Three lakh fraud companies were shut down due to demonetisation. Mahatma Gandhi wanted the Congress dissolved. I am just fulfilling his wishes,” he said. While defending the Rafale deal, he attacked the Congress for not supporting the army and air force enough. He said that the Congress left the army high and dry as during the Congress regimes; that the defence personnel did not have bullet-proof jackets to defend themselves. Similarly, on jobs, he defended his government and repeated past statements. According to him, schemes like Mudra loans and other measures have generated private jobs that are not captured in data sets. Critics have, however, mocked such government’s logic as “pakora economics”. The crucial question that Modi had to answer was repeated criticism against him for allegedly harming the autonomy of public institutions like the CBI and ED. Only a few days ago, opposition leaders had accused the Union government of using institutions like the CBI and ED to satisfy political vendetta. The sit-in protest by West Bengal chief minister Mamata Banerjee after the CBI tried to raid Kolkata police commissioner Rajeev Kumar’s office in the chit fund scam probe became a rallying point for Mamata Banerjee and other opposition leaders to attack the Modi government. The prime minister, however, attempted to spin the opposition’s allegation in his favour. “Desh ko lootne wale ko Modi dara ke rahega. Jinhone desh ko tabah kiya hai, unko darna hi hoga. Aise logon ke liye hi maine apni zindagi khapayi hai (Modi will scare those who have looted the country. Those who have destroyed the nation will have to fear. I have spent my life toiling only to scare these people),” Modi said. “Think about it, the Congress imposed Emergency, but Modi is destroying institutions. Congress insults Army, calls the army chief a gunda, but Modi is destroying institutions. Congress misuses Article 356, but Modi is destroying institutions. Congress leaders create stories that Indian army is doing a coup, but Modi is destroying institutions,” he added. Finally, he reasserted the merit of a full-majority government over that of a coalition government. He claimed that the opposition was uniting against him, and not his policies. “The people of India have seen the work a government with a full majority can do. They have seen the work of NDA. They do not want a “maha milawat” government of those who assembled in Kolkata,” he said. Soon after Modi’s speech ended, Gandhi retorted, “The prime minister gives long speeches in parliament. But I want to say only one thing. Listen to me carefully. The prime minister has personally taken Rs 30,000 crore from the military and has gifted it to his friend Anil Ambani (in the Rafale deal)”. Meanwhile, at the AICC meeting, it was decided that the Congress party would launch its campaign in Uttar Pradesh on February 11 with a road show by Priyanka Gandhi and Jyotiraditya Scindia, the two general secretaries in-charge of the state.